We finished the wooden intake today. 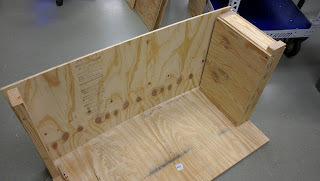 It has a few geometry errors that we need to fix before going into production on the real one. 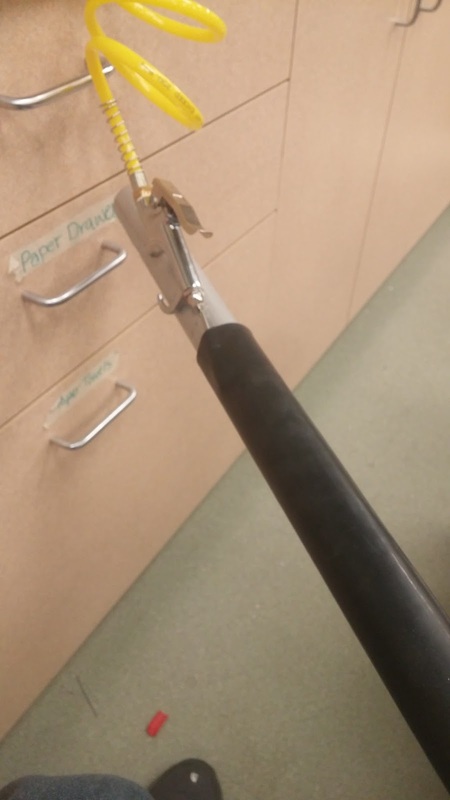 We also learned how to stretch 1" ID surgical tubing over 1.25" OD aluminum tubing. The trick is to use both soapy water and a lot of high pressure air plus some brute force. The drive train CAD is nearing completion, we are working on smaller details like the battery box and adding a few more cross members for strength. 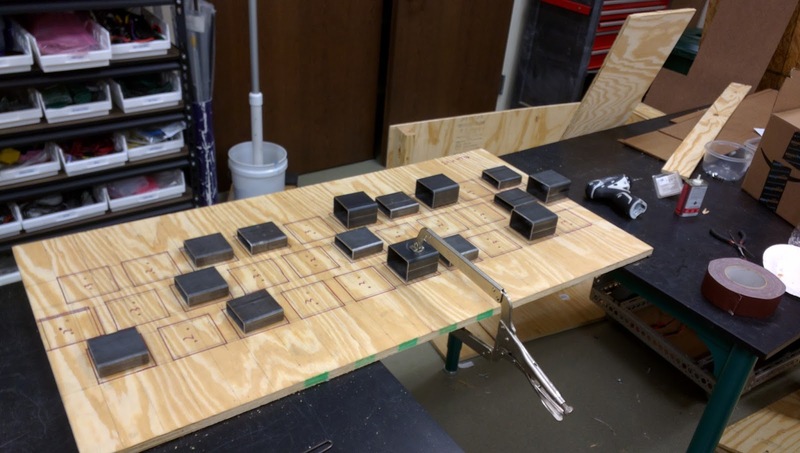 Our first run of production sheet metal should go to the Solarcraft late next week for production. 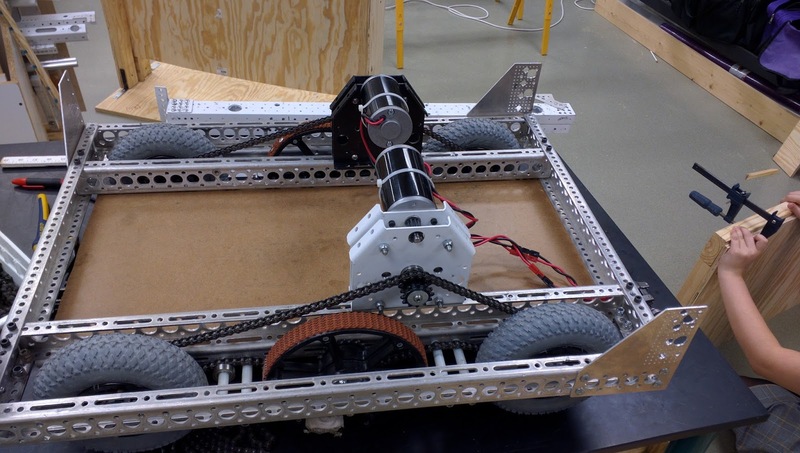 There is going to be a time crunch the last week of the season to get everything assembled before we wrap up the competition robot. 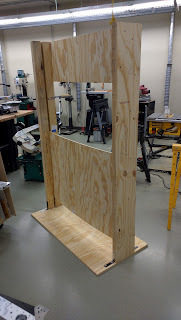 We still have 92 more days before the FRC World Finals are played that's a whole lot of time to iterate. 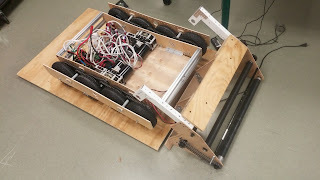 We wired up our wooden chassis today and have it driving around. 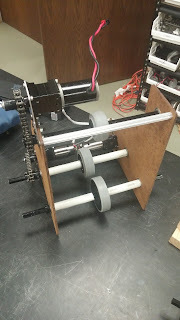 It's not the best prototype since it is far less rigid then the real robot will be, but it does give us some idea of how our drive train will behave. 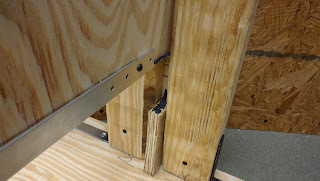 We also have been CADing on our intake geometry and our breaching/scaling arm as well. 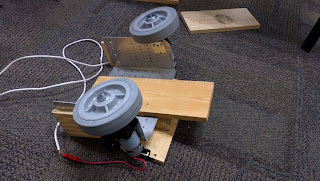 The prototypes for these should be up and running this weekend. We are over a third of the way through the season and the Q&A has already led to some big rule updates (a critical field dimension even changed). We want to take the time to highlight some other Q&As that teams may find helpful. This means that the brackets inside your robot's frame perimeter but permanently attached to your bumpers have to be between 4" and 12" from the ground like the rest of your bumpers. 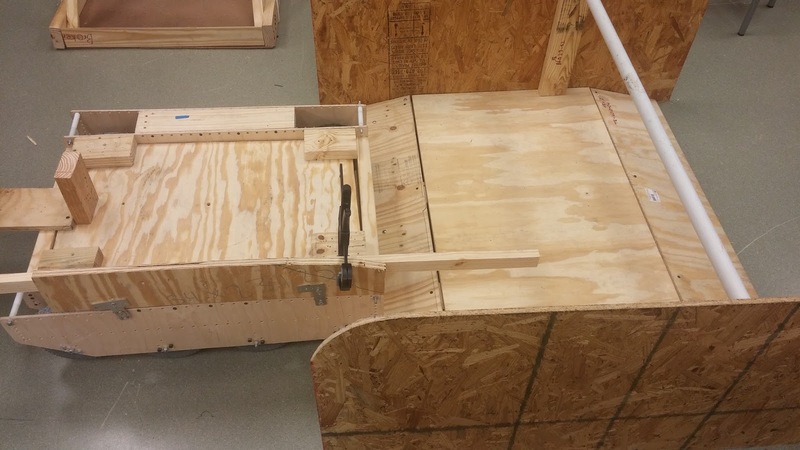 This means that if you have a gap in your bumpers you can have a full sheet metal frame behind the bumper gap to support the two loose ends. 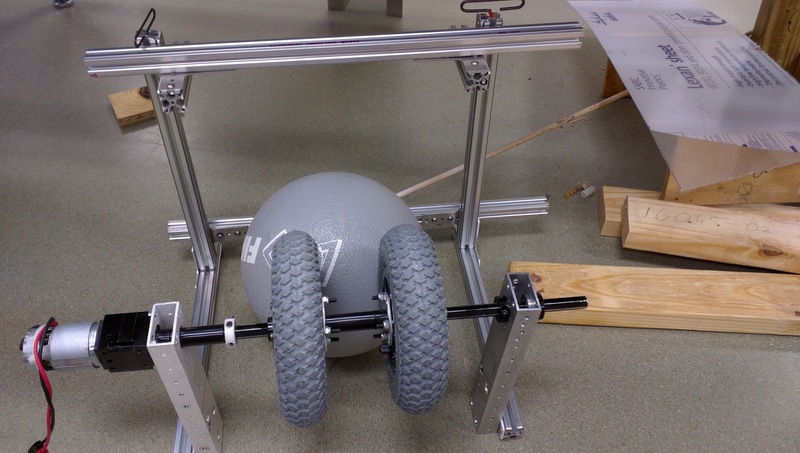 This could make for much stronger bumpers. 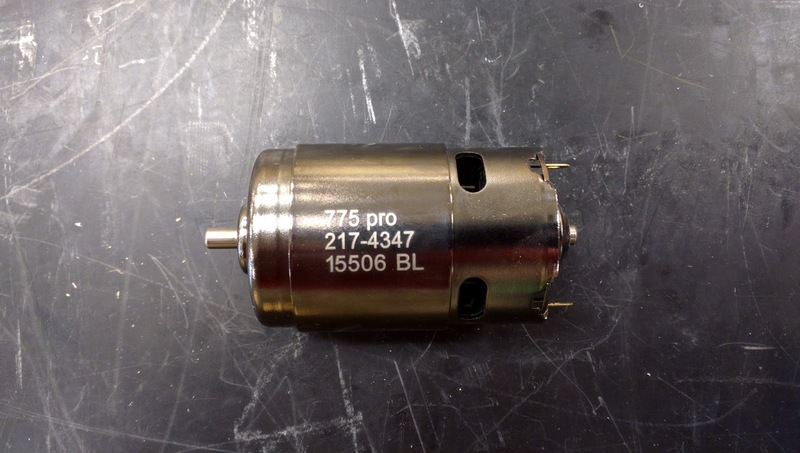 This could be cool for shifting or any small actuations that normally need a pneumatic cylinder. If you get a flat tire this year, you have to replace it. Tire sealant won't be allowed. We think they are getting a bit tired of answering questions. What will your team bring into the spy box? We had our design review meeting. Here is a very rough CAD sketch of the current robot plan. It has two folding arms one for breaching and scaling and another that intakes and stores the boulders. 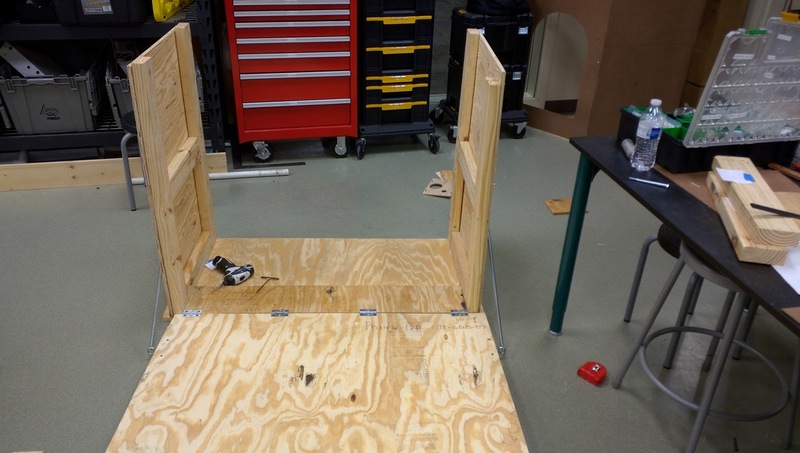 The shooter is integrated into the back of the robot. 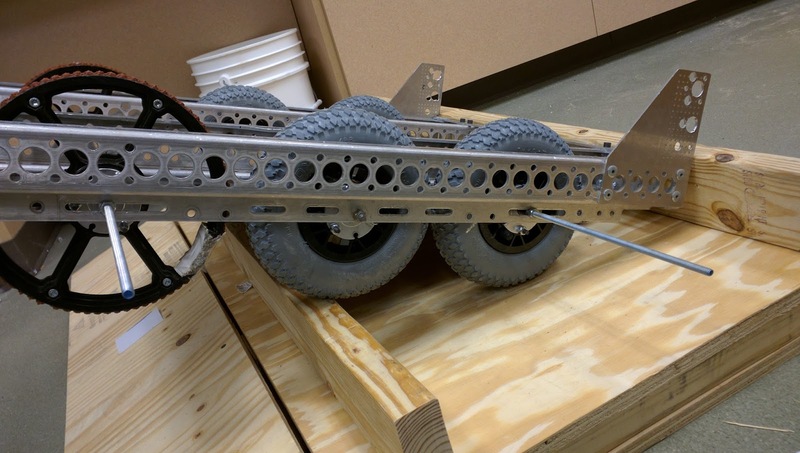 The shooter uses the tri-wheel design of our latest prototype. 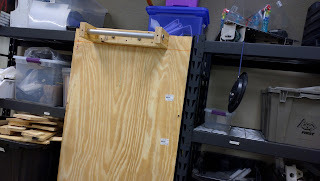 It's also able to fit under the low bar. 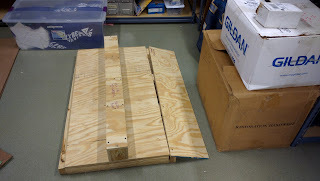 We started producing a full wooden version of our robot to test systems on today. We should have the drive train finished this weekend. 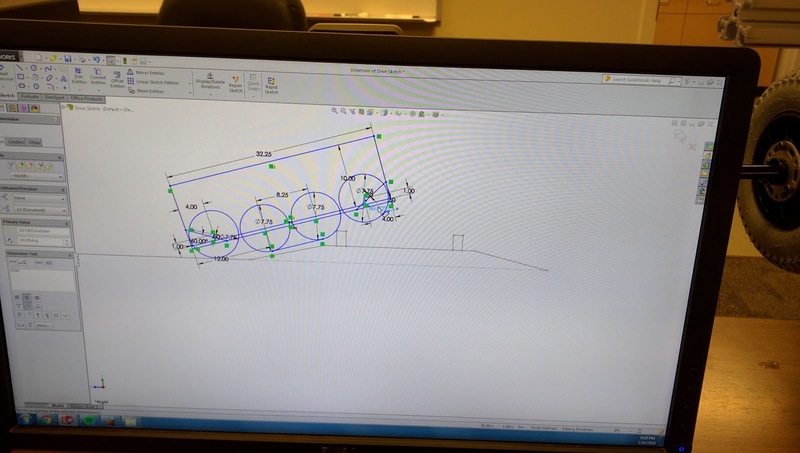 We are almost finished with our drive train draft CAD. We have started turning parts on the lathe to get ready for assembly. 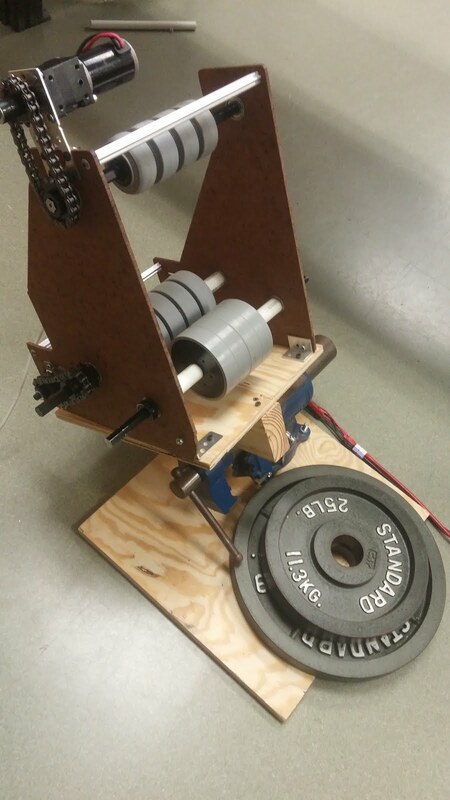 We will be cutting out the drive train on our router to make sure everything works. We installed VEX versaplanetary shaft encoders on our shooter and we will be able to get some good testing done over the weekend. Tomorrow we have our 2nd design review to update the entire team about the status of the design . 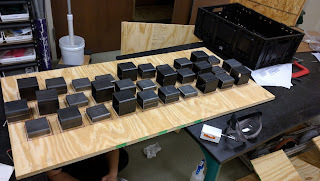 Now that we have finished building all the defenses, we can turn our full focus to working on our prototypes and finalizing our design. 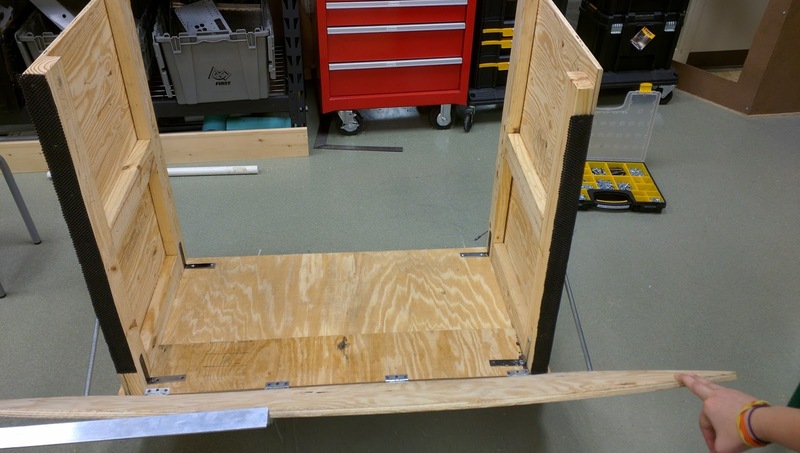 We built a wooden mockup of our chassis design to use as a base for our other prototypes. Right now, we're using an 8-wheel drive train with the ends tilted up for easier entry onto the various ramps in the field. We're also in the process of determining the best angle for a wedge that will be added to the front of our robot and lift the portcullis. 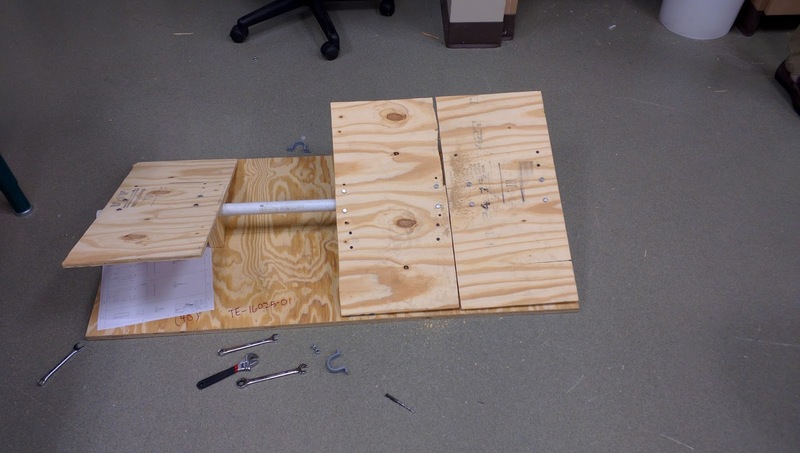 We also built the shooter prototype seen below, adapting a design created by our friends Team 2848. 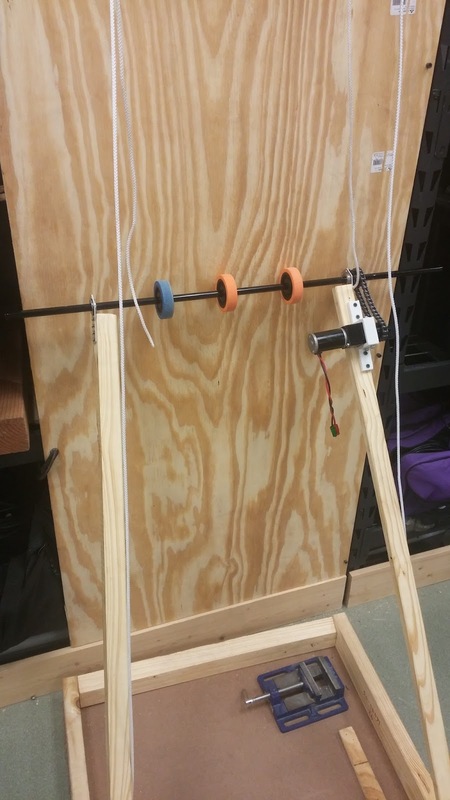 Using some of our various shooter prototypes, we were able to shoot the ball, but it lacked consistency in its trajectory. In the coming days, we will work to improve our shot and develop a way to get consistent results. Today we decided to step back and re-evaluate our kickoff design and strategy, resulting in a scrap of our previous design. For the rest of the day we completed various projects and began a couple new ones. We decided on an 8 wheel drive train using 200mm pneumatic wheels. Deciding that the rock wall and moat were the most important defenses regarding the drive train, we used CAD to find the best wheel placements to cross them. 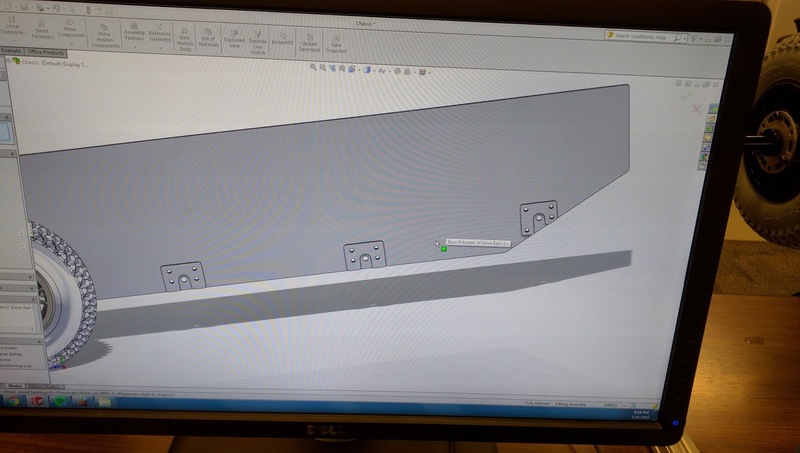 CAD drawing of the current drive train rails, which we will test later. 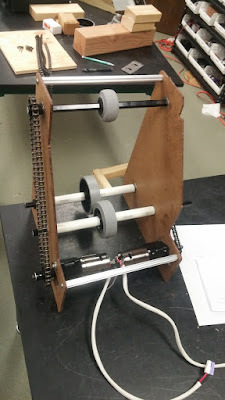 Anticipating a lot of strain on our drive wheel axles, we plan to test a 1114 Simbotics style wheel axle support system soon. 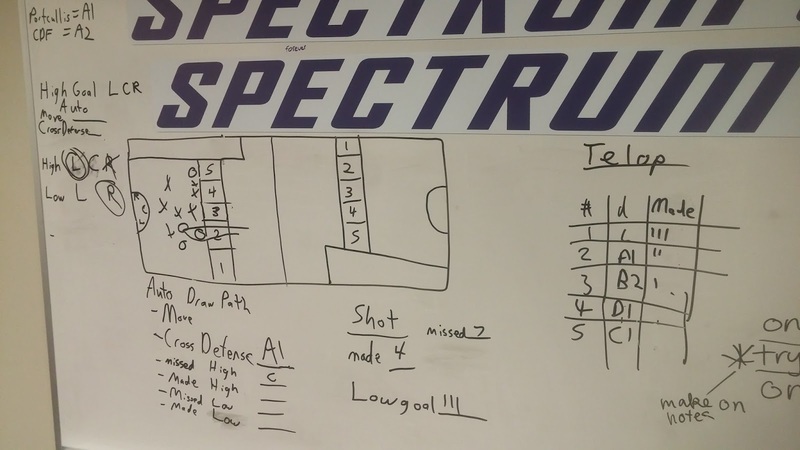 After the strategy discussion, we started testing possible shooters. 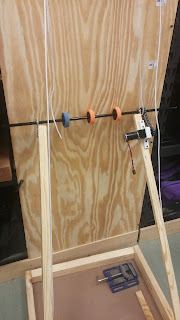 Because we want to avoid the ball's spin inhibiting its trajectory during shooting, we decided to begin with a side-to-side shooter instead of a fly-wheel shooter. Finally finished off the last defense, the rough terrain. 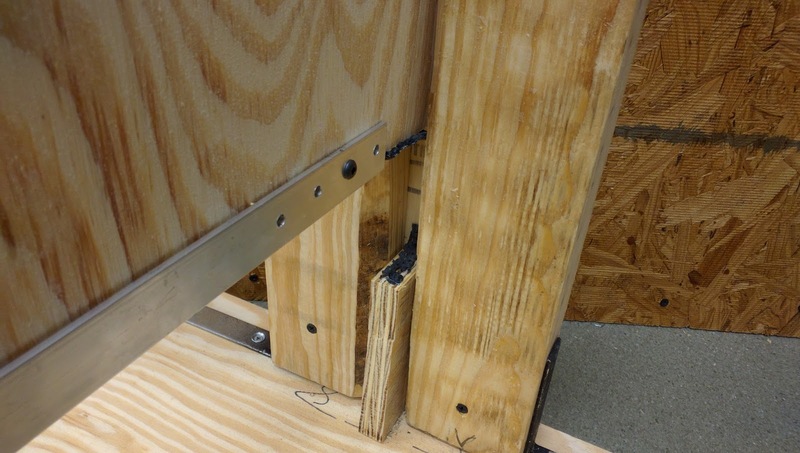 After many mistakes and distractions, we managed to complete our last defense in the closing moments of the day. We started off our meeting with a quick cleanup so we can be more productive. We also fixed our cheval de frise so that each plank can seesaw without locking up from friction. 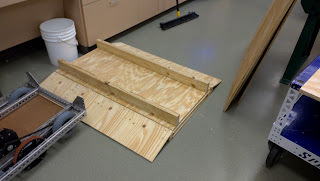 Additionally, we fixed our drawbridge by moving where the spring attaches so that it could pull the bridge up more easily. However, in this configuration the drawbridge tended to close with a lot of force and caused a general ruckus. We fixed it by using soft, foamlike mesh to dampen the hit. 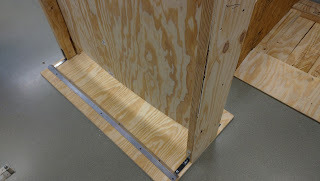 We also added a quick piece of 1.5" L extrusion to simulate the real field's portcullis. The drawbridge still slams with a decent amount of force. 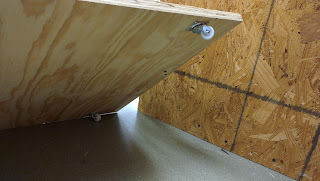 We've added shields to the sides of our defense platform and covered one ramp with polycarbonate. 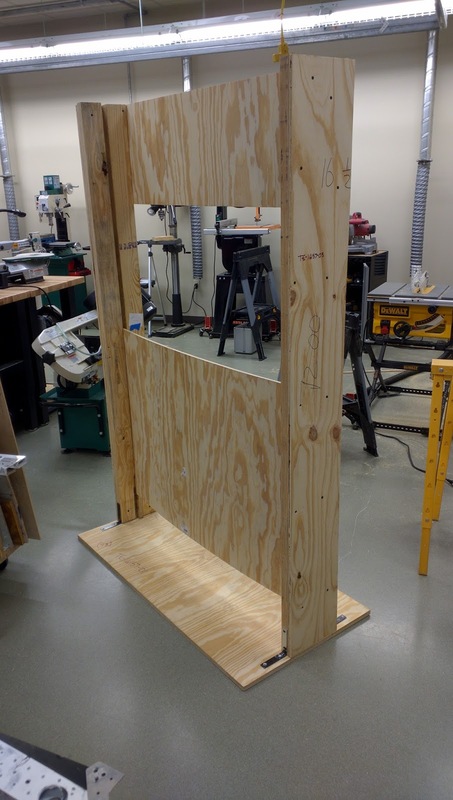 Unfortunately, our horizontal bandsaw blade didn't come in today, so progress on our ramparts and terrain has stopped for now. On the bright side, our West Coast Products 775pro came in. 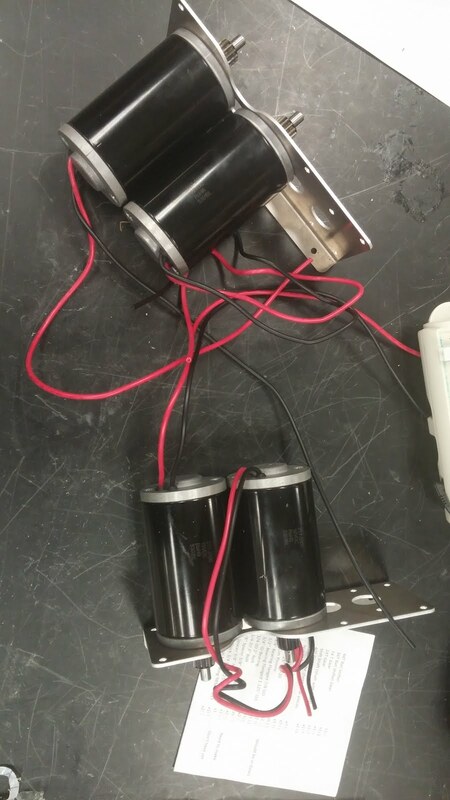 We're loving the motor's dark chrome/black color. We made some more progress our outerworks today. 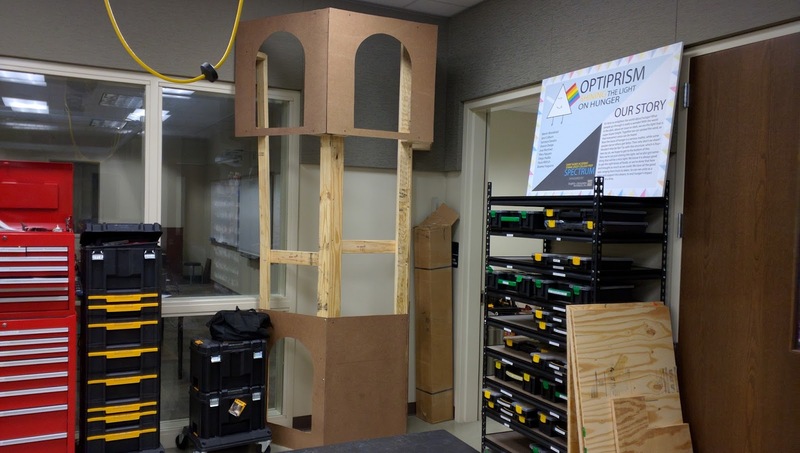 Our current drawbridge and cheval de frise need a little adjustment to work perfectly, but for now they're okay. 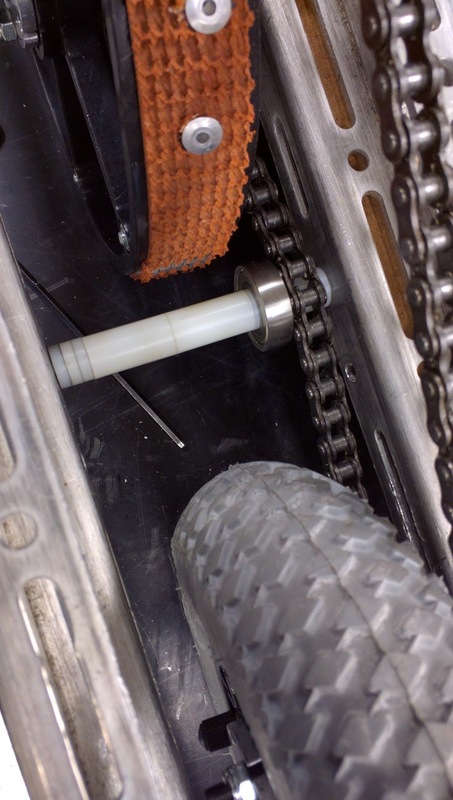 We were able to quickly CAD our new prototype drivetrain, but a broken bandsaw blade delayed fabrication. 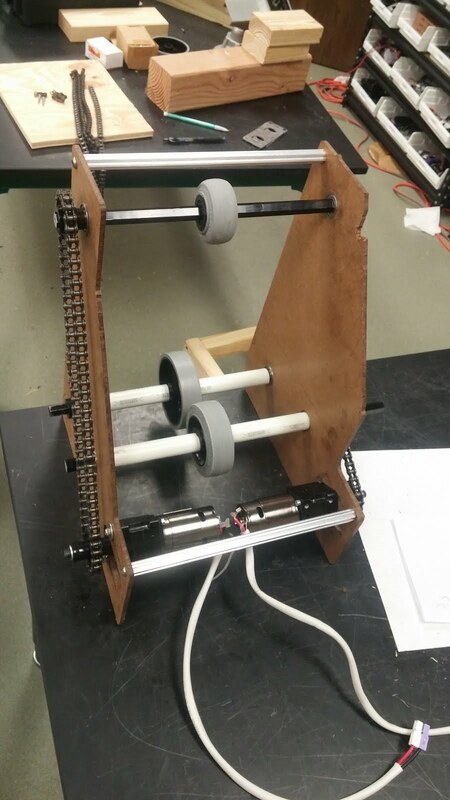 Our flywheel shooter is currently making the change from wood to Rev extrusion so we can adjust variables individually and precisely. In addition, we've also started prototyping a puncher and a portcullis breacher. The drawbridge is getting stuck instead of rising. 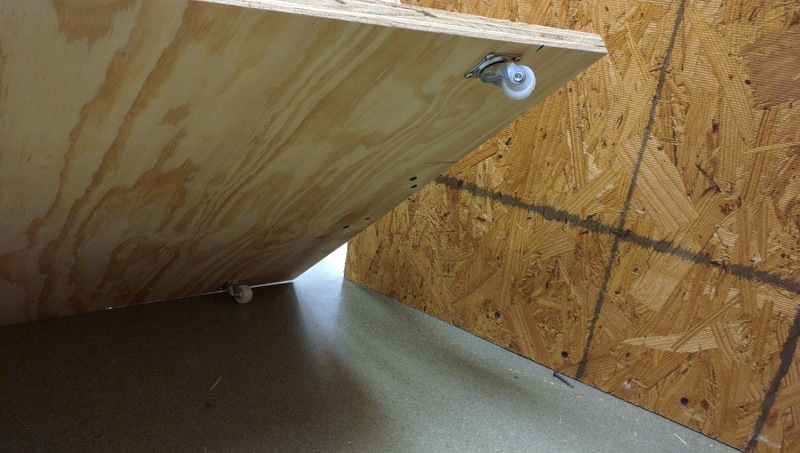 The cheval de frise platforms have too much friction, causing them not fall correctly. 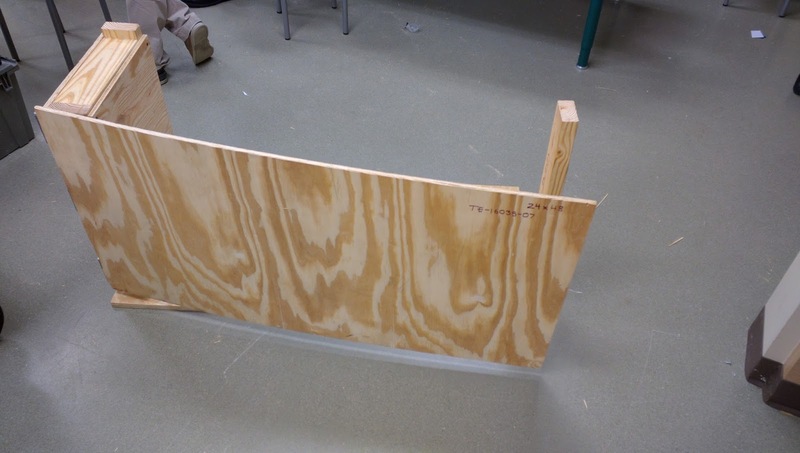 Today we continued to test our prototypes and build defenses. We're focusing on defense building right now so that we can test our future prototypes more completely and also have a complete field for our scrimmage in week 6. 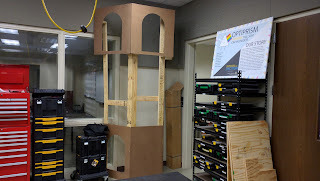 Today we made a sally port and a portcullis and gathered all the pieces for a cheval de frise and drawbridge. We also hope to get the rocky terrain and ramparts done by Thursday at the latest. In addition, we plan on making sheetmetal duplicates of a few defenses with help from our sponsor, Solarcraft. 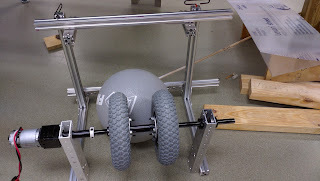 On our prototyping side, we are focusing largely on the test drivetrain. 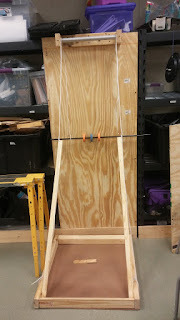 We were able to chain up both sides of the drivetrain and test how pneumatic wheels fare against the moat and rockwall. 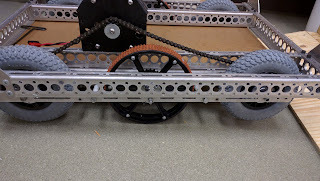 Unfortunately we faced some issues with chain slipping, chain tensioning, and bottoming out. As we were chaining up the second side, we over tensioned the chain which caused the gearbox to act up. 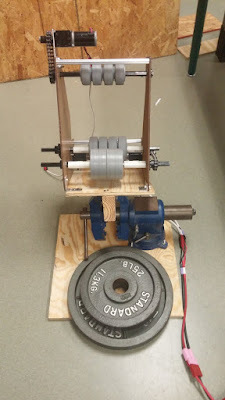 It made the pinion gear skip and made the left side suffer more resistance. After trying a few different solutions, we realized none of them were effective or permanent, so our next plan of action is to make a westcoast style, 6 wheel drivetrain out of 2x1 tubing. We plan to get a quick CAD model up of how we want wheel spacing before jumping into fabrication. Our last ditch effort was to toss a flangeless bearing where it was bottoming out in an attempt to make it easy to cross. Unfortunately, it was very ineffective. We also plan to upgrade our flywheel shooter prototype so that we can adjust different variables. 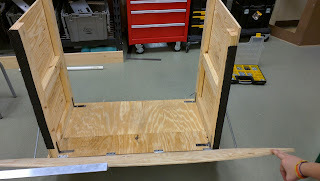 We've also begun a prototype for an over-the-bumper style collector similar to that of Miss Daisy XI. Our overall strategy for now is to imitate Team 254: The Cheesy Poofs and their style of prototyping by making a modular drivebase that we can attach prototypes to and and test on. The game was officially reveled on Saturday to over 3,000 teams world wide. Stronghold is a medieval themed tower defender style game. 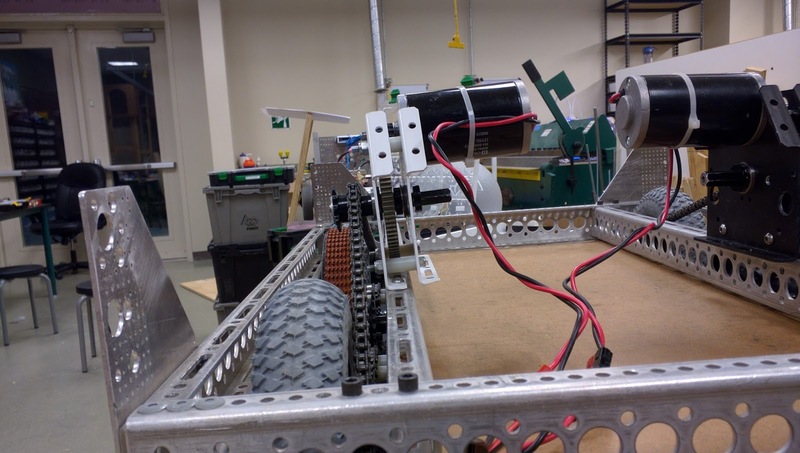 Alliances of 3 robots each compete against each other to breach their opponents defensive structures, shoot boulders into their tower, and eventually scale and capture their opponents tower. A one page game description can be found here. Below is the video description of the game. We encourage everyone to follow along with our progress, leave comments with questions and encouragement, and just stay up to date with what we are working on. Students if you haven't done the spring sign up list, please do so ASAP. Parent's an email went out on Sunday asking for volunteers to bring in meals for the team (If you didn't get this email, get in touch with Allen). Please sign up as soon as possible. The team appreciates your support. We also would love for you to send in snacks and drinks for the team as well. We want to thank all of our fantastic sponsors especially our two schools, St. Agnes Academy & Strake Jesuit College Prep. 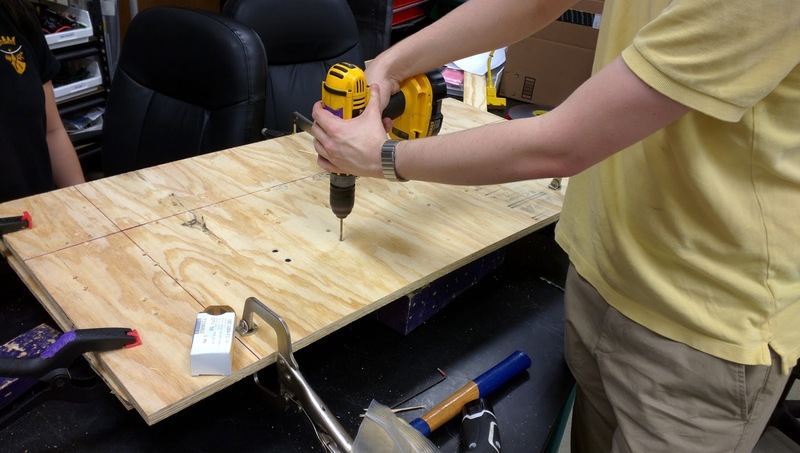 One of our most critical sponsors for the past several years has been Solarcraft Inc. 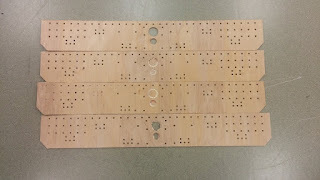 They have been providing laser cut and bent sheet metal for all of our past 3 robots. Last week our team was welcomed to their facility to tour their shop and learn about their operations. We even got to watch a part be cut by the laser and then operate the press brake. 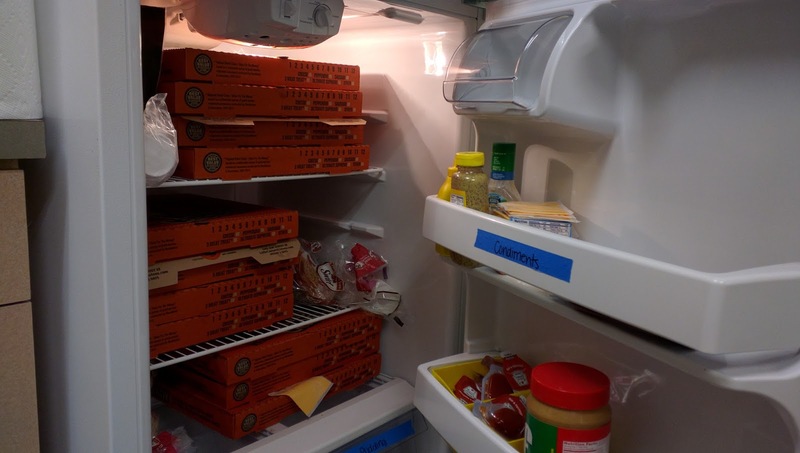 Do you work for a company that grants money to organizations in which you volunteer your time? 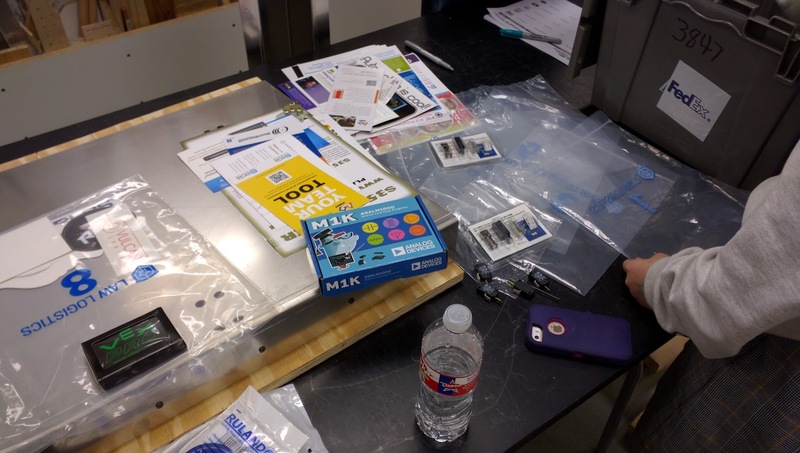 In the past, Spectrum has been fortunate to receive some grants due to company employees, spouses, and children working at Spectrum-hosted events like our Texas Robotics Invitational and First Lego League Tournaments. We know that ExxonMobil awards two types of volunteer grants. One is for a five-person team of employees, spouses, and dependents who volunteer a collective 20 hours at a specific Spectrum event. The other is when an employee, spouse, or dependent (only one person) volunteers 20 hours over a period of time. If you, a Spectrum team member’s parent are an employee of ExxonMobil, please let us know. We would appreciate if you could see if your employer also awards these types of volunteer grants. If so, please also email us so we can create a master list of potential volunteer grant possibilities.